Air compressors are used in numerous industrial and non-industrial processes across the globe. It enables the supply and control of air and gas by compressing the gas inside the cylinders with the help of a piston. Air-compressor along with check-valves regulates the flow of gas according to the requirements in different industrial processes. Rapid growth in automobile industry, increasing adoption of energy saving equipment for various operations, technological advancements in power generation sectors, rising demand for efficient air compressors owing to increasing infrastructure in industrial and non-industrial processes etc. are some of the key factors expected to augment the market growth for air compressor market in near future. The global air compressor pump market is estimated to expand at a CAGR of 4.1% over the forecast period i.e. 2016-2023. 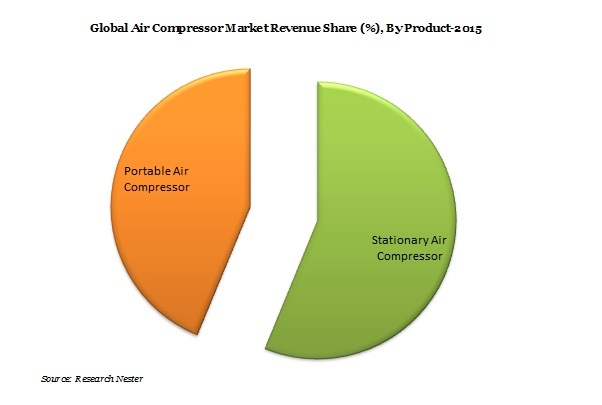 Further, the global market of air compressor is projected to garner USD 36.2 Billion by 2023 on account of increasing adoption of cost-effective production methods to increase profitability. However, rapid growth in Middle-East countries and increasing urbanization in Latin America region are offering essential opportunities for end-use industries for expansion of business which will further expected to drive the demand for air compressors in the region during the forecast period. In addition to that, emergence of pharmaceutical industries, huge investment in healthcare sector and rising concern towards quality product are projected to escalate the demand for air compressor pumps in near future. Rapid growth in industrial automation and automobile industries, introduction of next-generation air compressors, availability of retrofitting air compressors, growing demand of replacement, emergence of power, oil and gas industries in growing economies are some of the major key factors anticipated to boost the demand for air compressor in near future. Features of air compressor such as cost-effectiveness as compared to other conventional substitutes, low maintenance and low cost operations, wide-scale applications in numerous industrial & non-industrial processes, convenience in handing portable air compressors, are expected to fuel the demand for air compressor in countless end-use industries over the forecast period i.e. 2016-2023. Apart from this, the market is majorly driven by the continuous dip in the average price, rising adoption of energy efficient air compressors and availability of portable, advanced and high accuracy air compressors in the market are projected to help the air compressor pump market in the global marketplace. Furthermore, availability of less degradable parts and replacement of conventional air compressors by the advanced ones is likely to hike global demand for air compressors in near future. However, noise generation in heavy duty air compressors, air contamination in oil filled air compressors, increasing cost of raw material & periodic maintenance and replacement of air compressor parts in order to maintain efficiency are some of the factors hampering the growth of air compressor market globally.